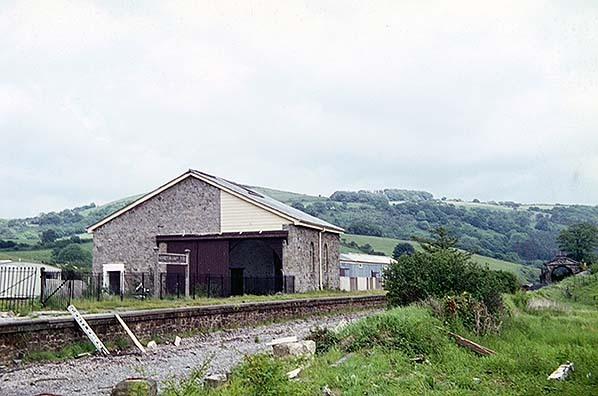 Present state: Although the trainshed was demolished shortly after total closure the goods shed and engine shed remain as does part of the platform. 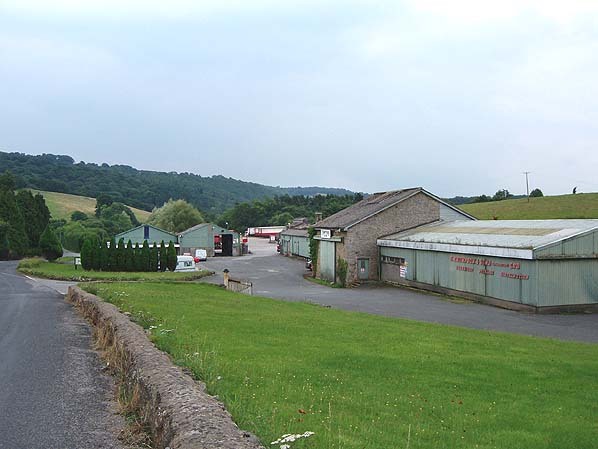 The site is occupied by road hauliers B. Thompson & Sons (Transport) Ltd.
Notes: The branch terminus was situated a quarter of a mile outside the town, the station was accessed by a sloping footpath off the main road, vehicle access was gained through a gated entrance further down station road towards Bovey. The main building was constructed of local stone whereas the trainshed at the west end of the platform was entirely timber; it originally had a glazed roof but this was covered over after WW2. 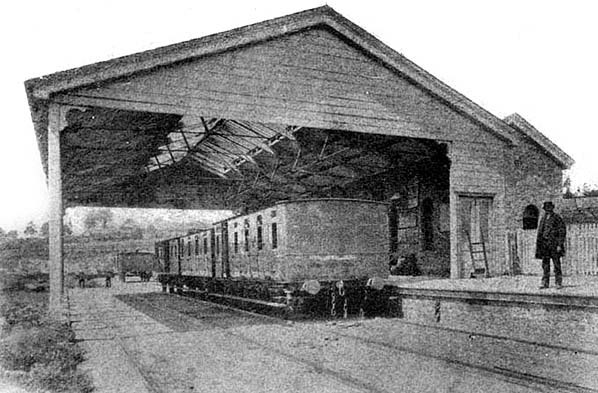 The dimensions of the station building were similar to that of Bovey, 59ft by 17ft and its orientation was more or less east-west. The design was not too dissimilar to Ashburton where the trainshed is still extant. Lighting for the station was supplied by the local gasworks co-located on site. The goods yard was accessed from the loop and was sited on the north side of the station and included a large stone goods shed, coal shed, 16 ton crane used for loading timber and a cattle dock constructed out of former broad gauge bridge rails. 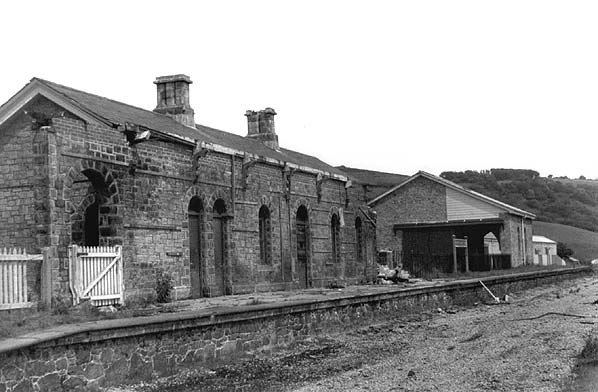 A stone engine shed was sited on the south side of the line at the east end of the station and a signal box was built on the side of the engine shed in 1893 following the regauging. Unusually the shed had sliding doors and it was in use until November 1947. 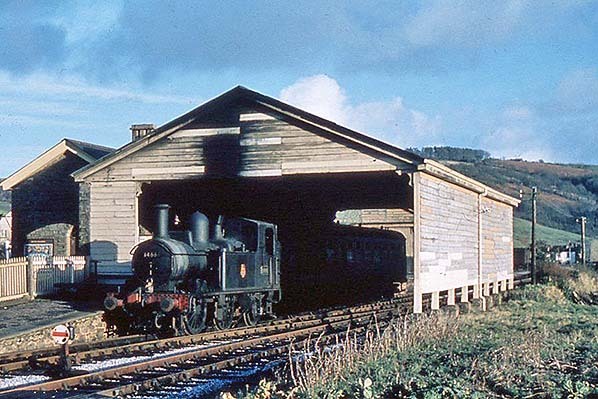 Locos were still serviced in the shed until closure to pasasengers in 1952. Freight traffic by rail ceased on 6th April 1964 but parcel traffic and coal continued by road until 1st January 1965, by that date part of the yard, including the engine shed was use as a coal store by the Co-op. The engine shed is now a listed building. 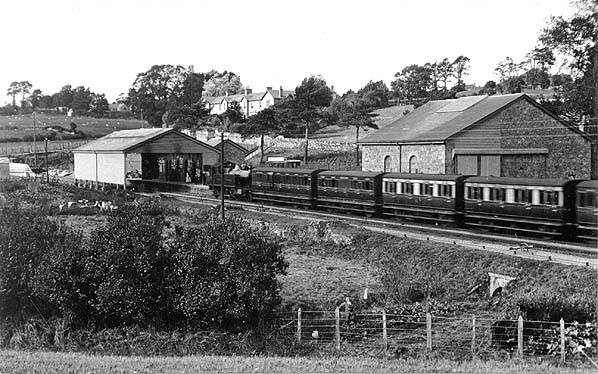 Moretonhampstead station was used for a special excursion five months to take local Sunday School children for a treat. On board the five coaches were 100 pupils and 200 adults. The line ran from the main line at Newton Abbot and following the valleys of the rivers Teign and Bovey some 12 miles to the terminus at Moretonhampstead; rising to a height of over 500ft to the edge of Dartmoor. From just south of Bovey to Teigngrace the line also followed the route of Devon’s first permanent railway, the Haytor Tramway which was used to transport granite from Haytor on Dartmoor towards the docks at Teignmouth. The railways tracks were constructed totally of stone. The Moreton & South Devon Railway Company Act was passed in 1862 for a broad gauge line from Newton Abbot to Moretonhampstead. Local people were slow to subscribe and bad weather delayed construction with the line finally opening on 4th July 1866. From the outset, the service was provided by the South Devon Railway who absorbed the local company in 1872. The bridges on the line were constructed for double track but never used as such. Goods traffic began on the line on 8th October, three months after the line opened to passengers. Initially the service was poor and traffic was sparse until the end of the century by which time the line was well used. The South Devon Railway was absorbed by the GWR in 1878 and the line was converted from broad gauge to standard gauge between 20th and 23rd May 1892. 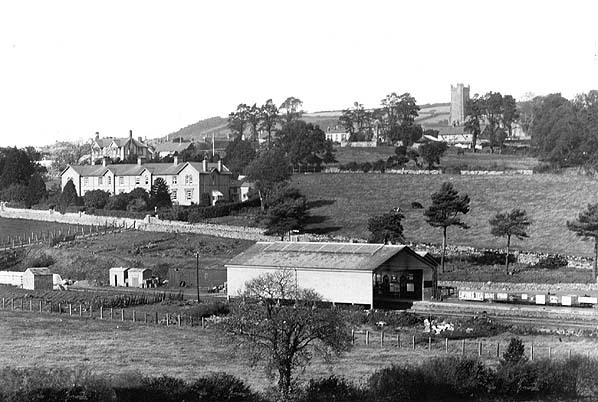 In 1906 the GWR began running busses from Moretonhampstead to Chagford in connection with the trains and as the Torbay resorts grew in popularity visitors flocked to the railway. Despite road competition the branch was busy until WW2 but no effort was made to attract business back to the line after the war. British Railways claimed that the line was losing over £17,000 a year so it was announced that passenger service would be withdrawn on 2nd March 1959. This caused much local discussion. 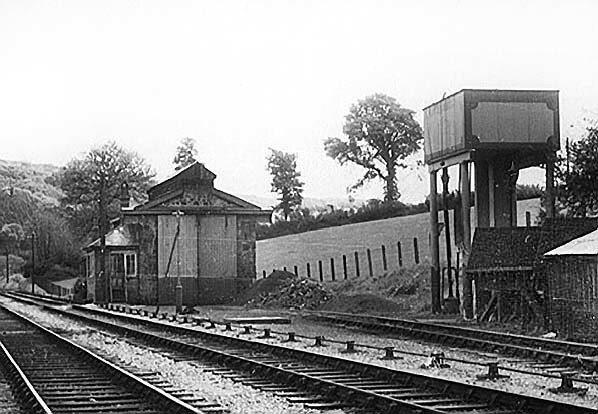 The closure of the Teign Valley line from Exeter in 1958 has hastened the demise of the line with a huge reduction in passenger traffic at the junction station of Heathfield. 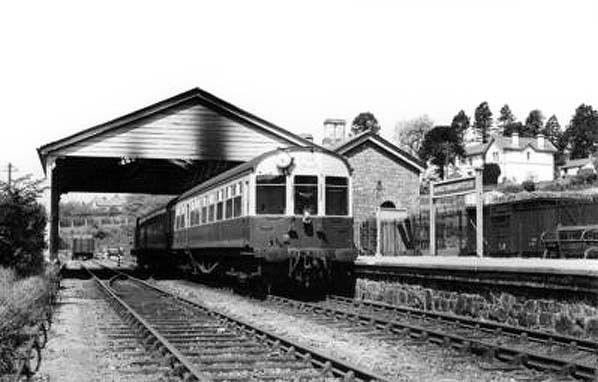 The last public passenger train left Moretonhampstead on 28th February 1959 ending 92 years continuous service. Initially freight traffic to Moretonhampstead was retained but this was cut back to Bovey on 6th April 1964. Track lifting north of Bovey commenced in 1965 and was completed on 21st June 1966. The freight service between Heathfield & Bovey was withdrawn on 4th December 1967. The last passenger excursion ran to Bovey on 5th April 1970 with four trains running during the day. Track lifting north of Heathfield was completed by early 1971. The carriage of fuel oil, ball clay and bananas from Heathfield continued, although Heathfield station was unstaffed after 5th June 1972 and the banana traffic ceased in 1975. The line had its share of royal visitors over the years, in 1983 The Prince and Princess of Wales spent the night in the royal train just south of Teigngrace. The Prince departed from Teigngrace Halt the following morning whereas the Princess departed from Heathfield, both attending separate engagements. In 1986 construction of the Bovey bypass started following the route of the line from just north of Bovey station through Brimley towards pottery bridge. After 1996 the remaining section of line was virtually abandoned with only two passenger excursions visiting the line in 1997, but in 1998 a once weekly service was introduced between Newton Abbot and Timber Siding at Heathfield taking ball clay away from a local pit where it is still mined. Occasional passenger excursions still visit Heathfield, most recently on 25.5.2002. The Moretonhampstead Branch: A railway from shore to moor by John Owen published by Waterfront, ISBN 0-946184-88-7. 1938 1:2,500 OS map shows the layout of the Moretonhampstead terminus. The single platform with its trainshed is seen in the centre, There is a run round loop opposite the platform with a small cattle dock and pens at the west end of the loop.Two sidings run behind the platform, one runs through a goods shed at the back of the platform and the other runs diagonally across the yards to terminate at the weighbridge. The yard crane, which has a capacity of 6 tons, is seen to the west of the goods shed. A single road engine shed is served by a line running off the loop, a watger tower and coaling stage are seen alongside the line. 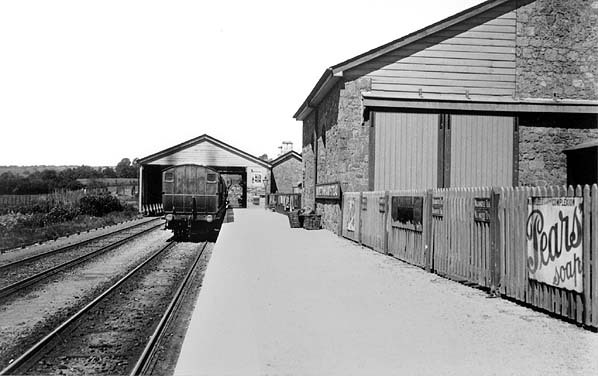 Moretonhampstead single road engine shed c1935. 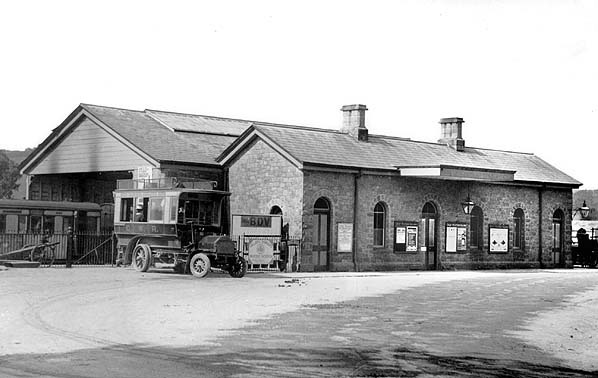 Note the signal box built onto the side of the shed in 1893. A water tower and coaling stage are seen on the right. Moretonhampstead Station and goods shed June 1965 shortly after the track was lifted. 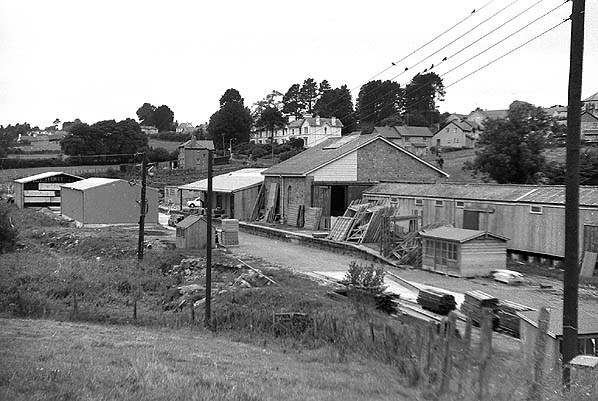 Mortonhampstead goods shed in 1965. Moretonhampstead Station in August 2005 seen from Station Road showing the original vehicle entrance still in use.